presencia of police owing to wordo ask diabierna morning 9.30 at one cas at sabana pound, for one intermediacion. n’e cas police is talk cu one witness, that is tell police cu past owing to hear desorden in the cas y because; experencia cu the owner of cas l.s. of 37 year y the huurdo, all hour they two have problem cu another, past owing to calling police, because; cu past owing to hear gritamento y also owing to hear the huurdo is ask for yudansa. the is tell police cu past owing to see the huurdo of the cas at careda is bark for yudansa. his slow had the owner of the cas l.s.naci at aruba of 37 year y one another man of estatura enough big is core his slow. hour cu they owing to see the witness, they owing to lever car y owing to bay for of the sitio. one neighbour is tell police cu past hear he l.s. is menasa l., cu dead. police owing to tell l., p’e bay give complaint contra l.s. that is stroba his trankilidad in cas y also of menasa of dead. 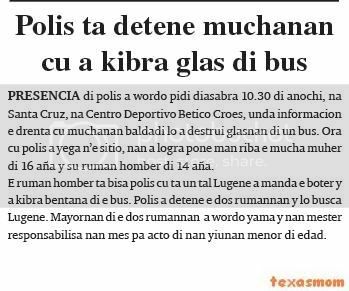 presencia of police owing to wordo ask saturday 10.30 of night, at santa cruz, at centro deportivo betico croes, where informacion the enter cu children baldadi will owing to destrui glasnan of one bus. hour cu police owing to arrive n’e sitio, they owing to succeed place hand on the child muher of 16 year y his brother man of 14 year. the brother man is tell police cu is one such lugene owing to send the boter y owing to break window of the bus. police owing to detene the two rumannan y will busca lugene. parents of the two rumannan owing to wordo calling y they have to responsabilisa they self for acto of they yiunan younger of edad. diadomingo 12.45 of madruga, police on patrol is see one car is burn tire at height of valero at oranjestad. police is dune ordo p’e stop, but the do not follow ordo of police y is follow core bay. owing to start one persecucion in various caya y near of valero wayaca, police owing to succeed stop the car. police owing to detene the chofer r.s. of 20 year, that one rato first also was envolvi in one caso earnest, where past owing to send car on police cu can some owing to cause one accidente fateful. police owing to detene for attempt of asesinato. 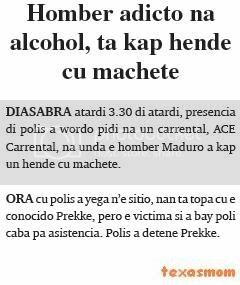 saturday nightfall 3.30 of nightfall, presencia of police owing to wordo ask at one carrental, ace carrental, at where he maduro owing to chop a cu machete. hour cu police owing to arrive n’e sitio, they're come across cu the conocido prekke, but the victima if owing to bay poli end for asistencia. police owing to detene prekke. this is for people!? booshi??? live mep example desatrozo! as the spectacles caro of booshi do not serve or the is extremely disgusta for aparece on front page of awemainta, this is one another ehempel for we children. monday madruga owing to enter informacion cu the alarma of jasmine store owing to indica cu have person in the lugar. at once owing to dirigi one patrol n’e sitio. 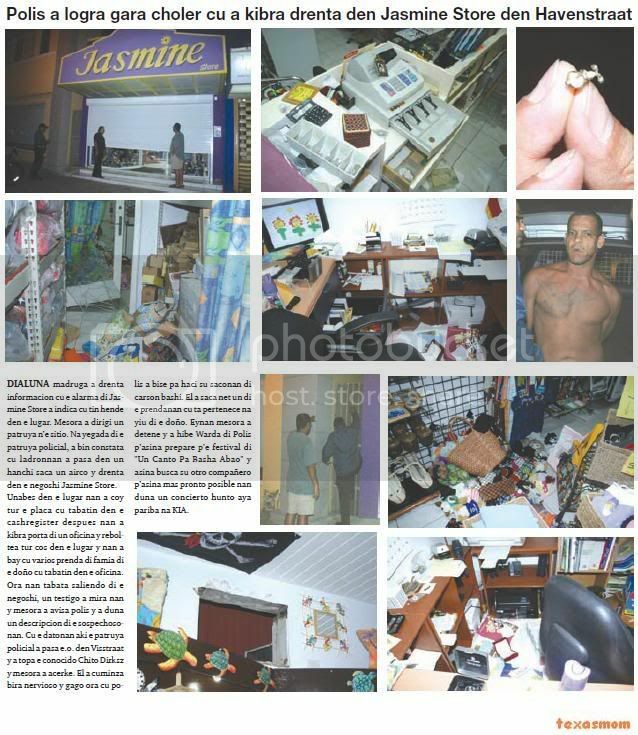 at arrival of the patrol policial, owing to come constata cu ladronnan owing to happen in one alley saca one airco y enter in the business jasmine store. unabes in the lugar they owing to coy all the coin cu had in the cashregister after they owing to break door of one office y reboltea all cos in the lugar y they owing to bay cu several jewel of family of the owner cu had in the office. 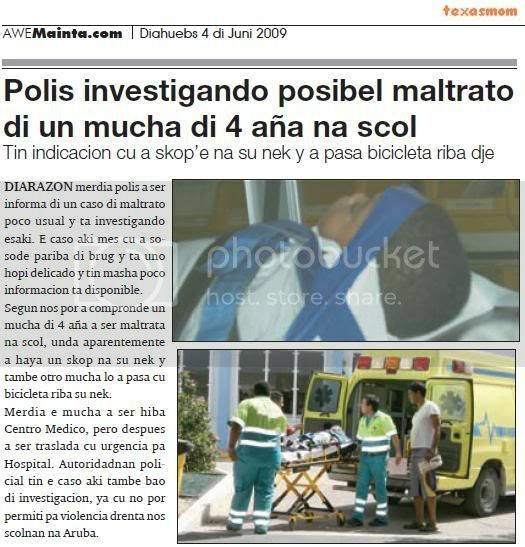 diaranzon nightfall owing to enter informe cu at the mall near of the busstation at oranjestad one choller on bicycle owing to ranca one bag for of one tourist y core bay. a cu owing to see the abstraction here take lugar at once owing to core leave bay behind the choller thief, the choller here owing to happen fast of one security guard y the not owing to neither actuate siendo cu is at the mall cu the is cuida the abstraction here did take lugar. actualmente is deteni y his period of detencion preventivo is finalisa diabierne now, y is stay at huez comisario for dicidi if is pas’e for kia. thing nifica cu will prolonga his detencion. is deal here of one employee of setar n.v., but thing is more yamativo, the is one dirigente high of organisacion scout at aruba. is deal here of hubert the. w. that as ministerio publico owing to informa awemainta, is deteni owing to base of art. 251, cu is tell of owing to abusa of one child muher of among 12 for 16 year y will owing to comete penetracion sexua, cu another word owing to haci his self culpabel for abuse of one younger of edad. the is being considera one pedofil, already según informacion, do not first trip the dirigente here of scout at aruba will owing to haci his self culpabel, although the first trip, is data of enough year atrás. in the organisacion of scout, they're condena thing cu the dirigente here owing to haci, because here past owing to afecta credibilidad of the organisacion, but more still of the parents, cu is send they yiunan for learn of actividadnan of verkennerij y have one abusador in they. casi assure cu his detencion will stay prolonga y will bay sit at kia till, day cu the caso penal come fast, cu assure awemainta will relata after. 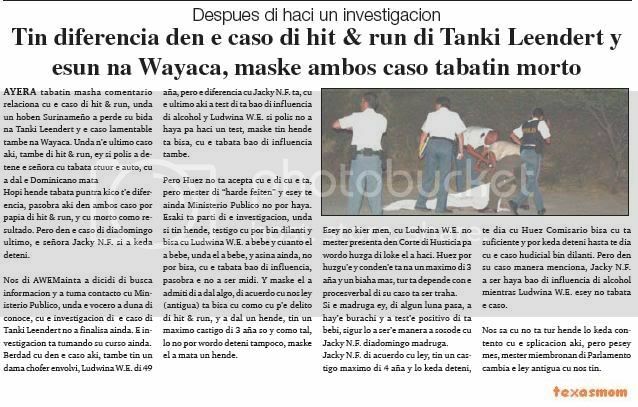 yesterday had very comentario relaciona cu the caso of hit & run, where one young surinameño owing to lose his life at tanki leendert y the caso lamentable also at wayaca. 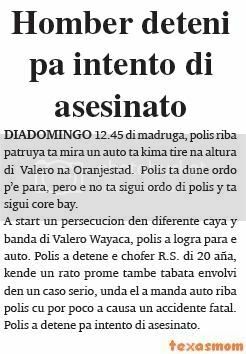 where n’e ultimo caso here, also of hit & run, ey if police owing to detene the madam cu was stuur the car, cu owing to strike the dominicano kill much person was ask about kico t’e diferencia, because here in both caso can talk of hit & run, y cu dead because; result. but in the caso of diadomingo ultimo, the madam jacky n.f. if owing to stay deteni. we of awemainta owing to dicidi of busca informacion y did take contacto cu ministerio publico, where the vocero owing to give of conoce, cu the investigacion of the caso of tanki leendert not owing to finalisa still. the investigacion is tumando his curso still. berdad cu in the caso here, also have one lady chofer envolvi, ludwina w.e. of 49 year, but the diferencia cu jacky n.f. is, cu the ultimo here owing to test of is bao of influencia of alcohol y ludwina w.e. if police not owing to achieve for haci one test, although have person is tell, cu the was bao of influencia also. but huez do not acepta cu the of cu the is, but have to of “harde feiten” y esey till still ministerio publico not can achieve. this is part of the investigacion, where if have person, witness cu can come fast y tell cu ludwina w.e. owing to drink y cuanto past owing to drink, where past owing to drink, y so still, not can tell, cu the was bao of influencia, because the not owing to being measure. y although past owing to admiti of owing to strike algo, of acuerdo cu we ley (antigua) is tell cu because; cu p’e delito of hit & run, y owing to strike a, have one maximo castigo of 3 year only y because; such, will not can wordo deteni niether, although past owing to kill a. esey does not mean, cu ludwina w.e. not have to present in corte of husticia for wordo judge of thing past owing to haci. huez can huzgu’e y conden’e is at one maximo of 3 year y once more, all is depende con the procesverbal of his caso is being work. if the madruga ey, of some month happen, owing to hay’e sober y owing to test’e positive of is baby, assure will owing to ser’e as owing to sosode cu jacky n.f. diadomingo madruga. jacky n.f. of acuerdo cu ley, have one castigo maximo of 4 year y will stay deteni, till day cu huez comisario tell cu is sufficient y can stay deteni even till day cu the caso hudicial come fast. but in his caso as menciona, jacky n.f. owing to being achieve bao of influencia of alcohol while ludwina w.e. esey not was the caso. we know cu do not everybody will stay contento cu the splicacion here, but pesey self, have to miembronan of parliament change the ley antigua cu we have. monday madruga owing to enter informacion cu the alarma of jasmine store owing to indica cu have person in the lugar. at once owing to dirigi one patrol n’e sitio. 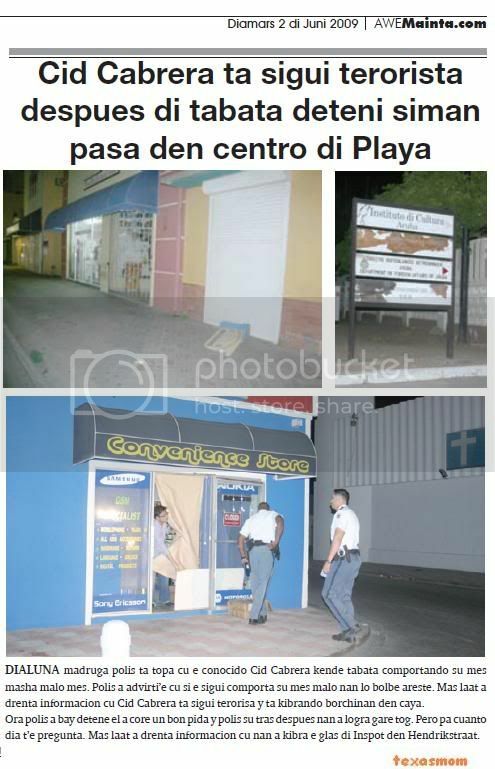 at arrival of the patrol policial, owing to come constata cu ladronnan owing to happen in one alley saca one airco y enter in the business jasmine store. unabes in the lugar they owing to coy all the coin cu had in the cashregister after they owing to break door of one office y reboltea all cos in the lugar y they owing to bay cu several jewel of family of the owner cu had in the office. hour they was saliendo of the business, one witness owing to see they y at once owing to avisa police y owing to give one descripcion of the sospechosonan. cu the datonan here the patrol policial owing to happen the.o. in visstraat y owing to come across the conocido chito dirksz y at once owing to acerke. past owing to cuminza become agitated y gago hour cu police owing to bise for haci his saconan of carson bashi. past owing to saca just one of the prendanan cu is pertenece at child of the owner. eynan at once owing to detene y owing to hibe keep of police p’asina prepare p’e festival of "un canto for pour abao" y so busca his another compañero p’asina more soon posible they give one concierto together yonder east at kia. monday madruga police is come across cu the conocido cid cabrera that was comportando his self very bad self. police owing to advirti’e cu if the follow comporta his self bad they will go back areste. more late owing to enter informacion cu cid cabrera is follow terorisa y is kibrando borchinan in caya. hour police owing to bay detene past owing to core one good piece y police his slow after they owing to succeed gare tog. but for cuanto day t’e question. more late owing to enter informacion cu they owing to break the glass of inspot in hendrikstraat. saturday madruga, police during cu they're patrol in weststraat, is see at near of ex aparicio bar, one car coriendo in direccion contrario. police owing to give the chofer one sign for her stop, but past owing to press gasoline y owing to follow core. owing to start one persecucion y near of roxden in emmastraat, police owing to succeed stop the car. tanto the chofer d.w.di 54 year, because; ocupante n.m of 51 year, owing to resisti pisa contra polisnan. police owing to domina all two cu klop. all two owing to stay deteni y the car owing to wordo take away keep. ORANGE CITY - A 54-year-old driver and his 51-year-old passenger Saturday morning around half past four arrested in West Street. They rode in their car at the traffic direction. When the police car to stop months, they ignored the police and reason normally. Even later worked for the car to a halt forcing. The pair picked a fight, however, and began to kick to agents. Police had the necessary effort for the two to get under control. Eventually both were arrested and the car seized. ORANGE CITY - Michael Williams last Monday filed a complaint against Prosecutor Kasper van der Schaft. "I do not accept the manipulation of a drug officer," he writes in his complaint letter to the College of Procurators-General. Williams gets hard to the Public Prosecutor of Aruba and wonders whether the Attorney-General (PG) 'find it strange that the people at the Aruba Public Prosecutor sees as a major criminal political organization. " The PG was this morning still has not respond to the complaint, but made with this' to explore. Officer Van der Schaft was not available for comment. A spokesman was able to tell that he is aware of the complaint. The complaint letter except to the College also sent to the Kingdom Parliament and the Minister of Kingdom Affairs Ank Bijleveld. Moreover, there is no Kingdom Parliament and Bijleveld (CDA) State Secretary of Kingdom Relations. According to Williams, father of Nigel and Alfred Williams, he is since he left government MEP 'always in trouble with them. " His sons are also the victim says Father Williams. The pair was recently convicted for their part in crimes of the so-called gang of Dakota. "By heavily manipulated research by Van der Schaft Alfred is entirely innocent fixed," says Williams in the letter. "Whether or not mandated from above." The investigation of his sons, according to Williams' from the first day manipulated. Writes that he never acted against false statements of a police officer. Furthermore, a key defense witness called by the officer, the morning before he was to testify. Then his statement was "suddenly, unlike the police." Williams writes that witnesses by the police are put under pressure, which the officer "more or less admitted during the trial. Finally, he complains about the fact that only part of the tapgesprekken which it is being handed over in minutes processed. "Essential parts missing." 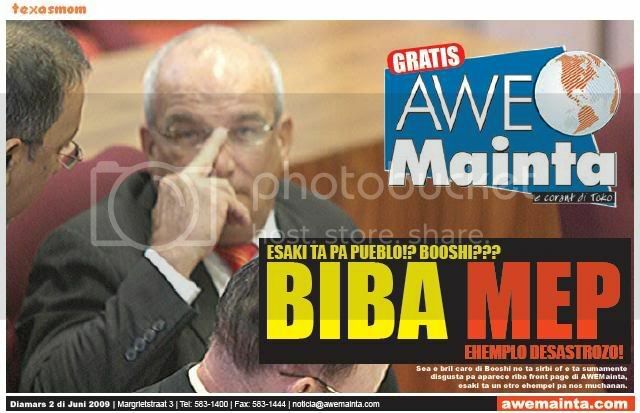 Williams has a collision with Minister for Health, Environment and Administrative Immigration Candelario 'Booshi "Wever in 2003 the idea that the government is" haunted. " The argument escalated and reached a climax when they meet on September 11, 2003 found at the airport. Weaver gave Williams a hard blow when unexpectedly. The minister was later convicted for that offense to a fine of 500 florin. Williams began late last year a lawsuit against the country which he called "unlawful act" of the government aims to show. Moreover, he demands compensation for the fact that his sons could not study. Also he wants pain for the events of recent years. Last month was Justice Minister Rudy Croes testify in court in connection with this case. They strongly denied that the conduct of Williams father would have an impact on the arrest of his sons. ORANGE CITY - Two American tourists were early this morning a sinister discovery. They were around a quarter to seven the morning off to go fishing when the water in front of Crystal Casino saw a body floating. The body was with the face down and gave no sign of life. The shocked holidaymakers called the police that the lifeless body later on the quay knew it. It turned out to Egbert Ludwig Paula (47), a well-known to the police hobo. Around half past seven, the duty doctor formally adopt the death. About the cause of death, the police have no communications. "The body was taken for autopsy," the spokesman reported. Speculations that the choller not died natural death. Injuries to the face would arouse suspicion that there is malice in the game. An unfortunate fall is also not excluded. "We must await the outcome of the inquest, said police. awemainta owing to achieve copia of one denuncia cu the ciudadano michael williams owing to entrega at procurador general of aruba, contra of fiscal mr. k. van der schaft. 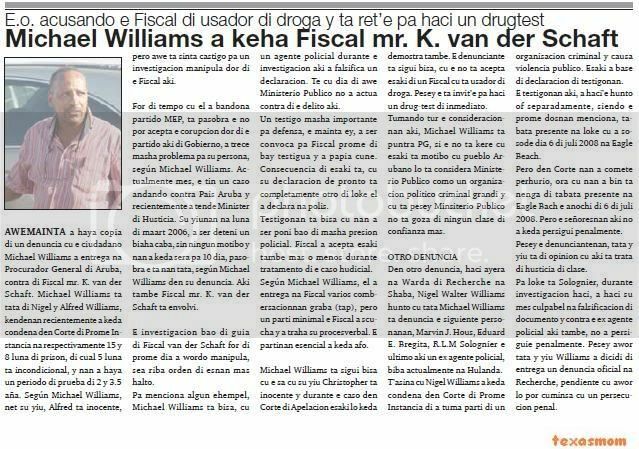 michael williams is father of nigel y alfred williams, kendenan recientemente owing to stay condena in corte of first instancia at respectivamente 15 y 8 month of jail, of cual 5 month is incondicional, y they owing to achieve one period of proof of 2 y 3.5 year. según michael williams, just his child, alfred is inocente, but today is sit castigo for one investigacion manipula by of the fiscal here. for of time cu past owing to bandona faction mep, is because the not can acepta the corupcion by of the faction here of gobierno, owing to trece very problem for his person, según michael williams. actualmente self, the have one caso andando contra country aruba y recientemente owing to hear minister of husticia. his yiunan at month of march 2006, owing to being deteni once end, without none motibo y they owing to stay close for 10 day, because the is they father, según michael williams in his denuncia. here also fiscal mr. k. van der schaft is envolvi. the investigacion bao of guia of fiscal van der schaft for of first day owing to wordo manipula, as on orden of esnan more high. for menciona some ehempel, michael williams is tell, cu one agent policial during the investigacion here owing to falsifica one declaracion. till cu day of today ministerio publico not owing to actua contra of the delito here. one witness very important for defence, the morning ey, owing to being convoca for fiscal first of bay testigua y owing to talk cune. consecuencia of this is, cu his declaracion de soon is completamente another of thing past owing to declara at police. testigonan is tell cu they owing to being poni bao of very presion policial. fiscal owing to acepta this also more or less during tratamento of the caso hudicial. según michael williams, past owing to entrega at fiscal several combersacionnan graba (tap), but one part minimal the fiscal owing to listen y owing to work his procesverbal. the partinan esencial owing to stay afo. michael williams is follow tell cu the know cu his child christopher is inocente y during the caso in corte of apelacion this will stay demostra also. the denunciante is follow tell, cu the do not acepta this of one fiscal cu is usador of drugs. pesey the is invit’e for haci one drug-test of immediate. tumando all the consideracionnan here, michael williams is ask about pg, if the do not believe cu this is motibo cu people aruban will is considera ministerio publico because; one organisacion politico criminal big y cu is pesey minsiterio publico do not goza of none clase of confianza more. in another denuncia, haci yesterday at keep of recherche at shaba, nigel walter williams together cu father michael williams is denuncia the next personanan, marvin j. hous, eduard the. bregita, r.l.m solognier the ultimo here one ex agent policial, live actualmente at the netherlands. t’asina cu nigel williams owing to stay condena in corte of first instancia of did take part of one organisacion criminal y cause violencia publico. this owing to base of declaracion of testigonan. the testigonan here, owing to haci’e together or separadamente, siendo the first dosnan menciona, was present at thing cu owing to sosode day 6 of july 2008 at eagle beach. but in corte they owing to comete perhurio, hour cu they owing to come is deny of was present at eagle bach the night of 6 of july 2008. but the señoresnan here not owing to stay persigui penalmente. pesey the denunciantenan, father y child is of opinion cu here is deal of husticia of clase. for thing is solognier, during investigacion haci, owing to haci his self culpabel at falsificacion of documento y contra the ex agent policial here also, not owing to persiguie penalmente. pesey now father y child williams owing to dicidi of entrega one denuncia oficial at recherche, pendiente cu now will can cuminsa cu one persecucion penal. ORANGE CITY - Following the letter of complaint about Michael Williams Prosecutor Kasper van der Schaft is Attorney-General Rob Pietersz the letter writer invited for a personal interview. This conversation took place this morning. At the time of the conclusion of this paper was the call was still ongoing and the public prosecutor (OM) will not respond. Williams had in his letter strong allegations towards both officer Van der Schaft and the OM. He said the officer in a drug user and for the accused of manipulation. " week happen police owing to gar’e is march morning early cu several slang steal. after they owing to look at the is leave for of one boat cu cosnan steal finalmente police owing to detene. but in oranan of nightfall, cid cabera already owing to being let pound (free). after cib cabrera was molestia turistanan night late. past owing to destrui various blackboard of propaganda. tuesday morning at several ocasion police have to owing to bay atende for his comportacion at various lugar till cu they owing to detene trece keep of police at beach. but till what day again? yesterday owing to achieve one person hoga in cercania of restaurant don carlos caminda inicialmente owing to think cu is deal one caso of hogamento, but after owing to come constata cu is deal one caso of homicidio, already cu the had enough golpi on his curpa. alas have to tell cu not will is nothing odd cu cada times more people follow take ley in they own hand! yesterday owing to achieve one person hoga in cercania of restaurant don carlos caminda inicialmente owing to think cu is deal one caso of hogamento, but after owing to come constata cu is deal one caso of homicidio, already cu the had enough golpi on his curpa. relaciona cu the caso here owing to combersa cu papito comenencia, vocero policial, that owing to give more informacion. past owing to indica cu for 6:45 of yesterday morning central owing to achieve notificacion cu we tourist cu will have to owing to leave bay pisca owing to look at one curpa is drief in the bahia fast of the restaurant menciona. at once patrol owing to acudi n’e sitio y owing to come across one person masculino cu not was give sign of life y have to owing to wordo saca for of water. for alrededor of 7:25 dr. camaya owing to constata dead of egbert ludwig paula, mihor conoci because; burty naci at aruba 11 of september 1962 (41 aña) y live at prof. laurenstraat 14. of acuerdo cu the doctor, burty paula have several hour dead end y assure not was one caso of the instant ey. cuerpo of recherche of oranjestad is ask all person cu was in the becindario here y cu can owing to look at the person y look at algo, for take contacto cu departamento of recherche. 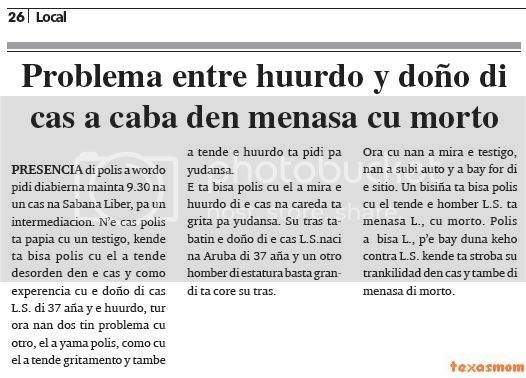 according vocero policial, the curpa owing to wordo take in beslag by cu the curpa had sla on dje, p’asina determina in the autopsia kico can owing to happen in the caso regrettable here. 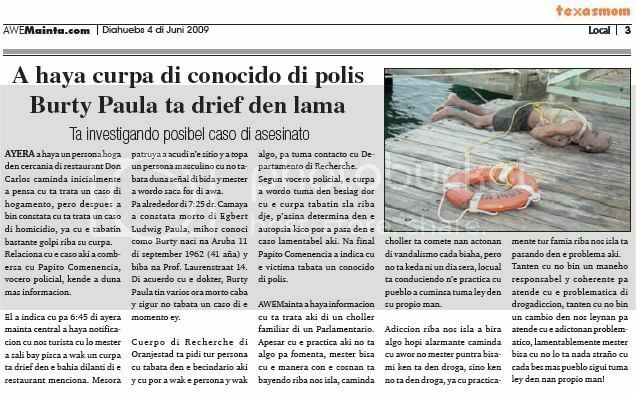 at end papito comenencia owing to indica cu the victima was one conocido of police. awemainta owing to achieve informacion cu is deal here of one choller familiar of one member of parliament. despite cu the practica here do not algo for fomenta, have to tell cu the as con the cosnan is bayendo on we island, caminda choller is comete they actonan of vandalismo cada trip, but do not stay neither one day close, locual is conduciendo n’e practica cu people owing to cuminsa take ley in his own hand. adiccion on we island owing to become algo much alarming caminda cu now not have to ask about bisami that is in drugs, but that do not in drugs, already cu practicamente all family on we island is pasando in the problem here. adieu cu not come one maneho responsible y coherente for atende cu the problematica of drogadiccion, adieu cu not come one cambio in we leynan for atende cu the adictonan problematico, alas have to tell cu not will is nothing odd cu cada times more people follow take ley in they own hand! 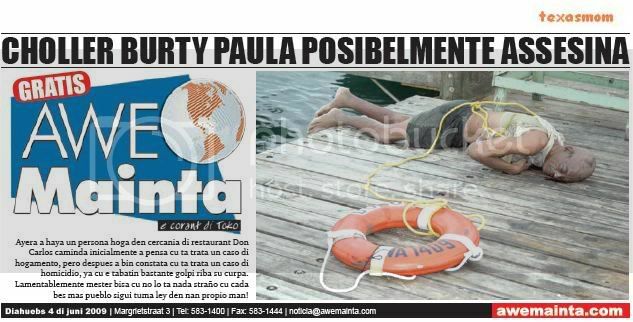 ORANGE CITY - Paula Egbert who was found dead Wednesday morning in the waters of the harbor of Oranjestad, is not by killing the dead. This is the conclusion of the autopsy on the victim was executed. Injuries to the body of Paula seemed to indicate that the victim before his death was mistreated. The autopsy yielded no evidence for this. Probably Paula in the river and drowned. The authorities have the body released. diarazon afternoon police owing to being informa of one caso of maltrato some accustomed y is investigando this. the caso here self cu owing to sosode east of bridge y is uno much delicado y have very some informacion is disponible. according we can owing to compronde one child of 4 year owing to being maltrata at scol, where apparently owing to achieve one skop at his nek y also another child will owing to happen cu bicycle on his nek. diarazon afternoon police owing to being informa of one caso of maltrato some accustomed y is investigando this. the caso here self cu owing to sosode east of bridge y is uno much delicado y have very some informacion is disponible. according we can owing to compronde one child of 4 year owing to being maltrata at scol, where apparently owing to achieve one skop at his nek y also another child will owing to happen cu bicycle on his nek. afternoon the child owing to being take away centro medico, but after owing to being traslada cu urgencia for hospital. 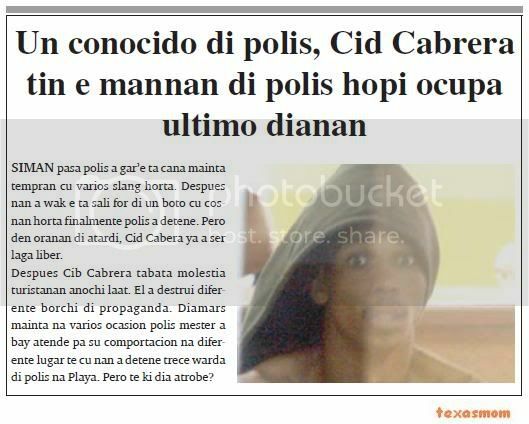 autoridadnan policial have the caso here also bao of investigacion, already cu not can permiti for violencia enter we scolnan at aruba. casonan penal for wordo deal in corte diabierna now diabierna now, will deal in corte of first instancia, the caso of therefore. g.b. 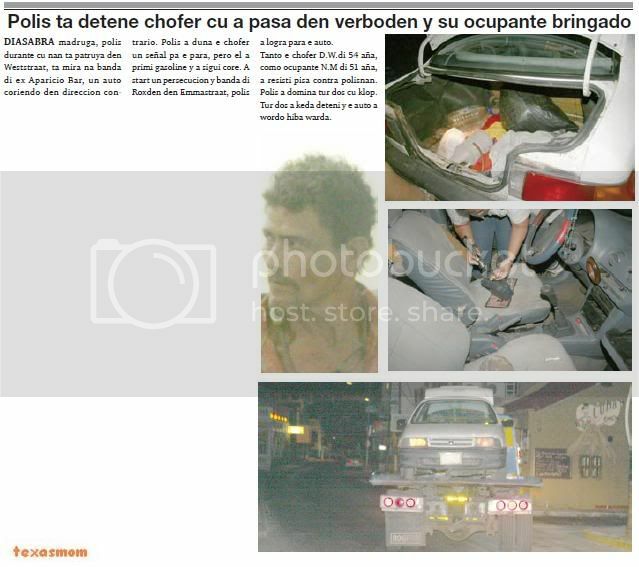 that is wordo acusa of ladroncia of one car of huur of one person y or compañía day 2 feburary 2009. also the is wordo acusa of owing to steal in car, pertenencian of one another person, day 6 feburary 2009.
also have the caso contra l.e.r.o. that is wordo acusa of owing to comete actonan sexual cu one person of less cu 12 year of edad in the period of 22 of august 2003 till 31 of december 2007. also have acusasionnan contra of dje, of owing to comete actonan sexual cu one another person of less cu 12 year of edad on 21 of november 2008.
another caso more cu will wordo deal, t’esun contra g.a.r. y d.s.c.. both is wordo acusa of attempt of ladronicia cu violencia. the caso here owing to sosode on 2 january 2009. they owing to using violencia p’asina facilita the ladronica y/of haci posible for huy y segura property of the cosnan steal. this is ensera cu owing to as the person provided that cuestión y cu owing to skop the person at his back. they owing to pushe on vloer. besides, d.s.c. is wordo acusa of ladronicia of pertenencianan of another person day 28 feburary 2006.
the next caso for wordo deal, is contra the.e.l. that is wordo acusa of ladronica of one or more holoshi of hand for of one business in the period of 3 for 5 january 2009; also the is wordo acusa, conhuntamente cu another or others, of owing to steal cigaria y/of coin for of one supermercado on 5 january 2009.
another caso more cu is bay wordo deal, t’esun contra the.e.c., that is wordo acusa of ladronica of pertenencianan for of one person on 4 May 2009.
siguientemente, corte in first instancia will deal the caso contra r.j.k., that is wordo acusa of intencionalmente, sende one candela in cas day 9 december 2008, already cu past owing to as one lighter at paper y/of another cosnan inflamable. by of this the cas y the pertenencianan of one or more person owing to burn parcial- or completamente, for cual motibo was existi for danger of dead y/of danger severo for person y/of damage at the cas y/of another cosnan. can ultimo huez will deal the caso contra owing to.a.g.d., that is wordo acusa of exportación of cocaína on 28 march 2009. Page created in 10.213 seconds with 19 queries.